Last week was pretty hectic with some unexpected but very welcome guests popping in and staying with us for the better part of the week. The guest was my friend with her 4 year old en route to India who had to stop and spend time at my place due to some messed up travel plan. Since it was summer but the heat was not overbearing we took the kids to an orchard near my home. 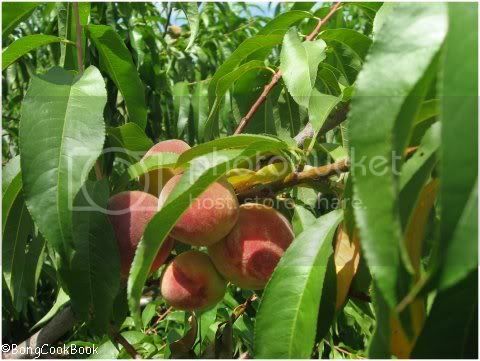 The strawberry season was over and the peaches were just ripening to be picked, so peaches it was. 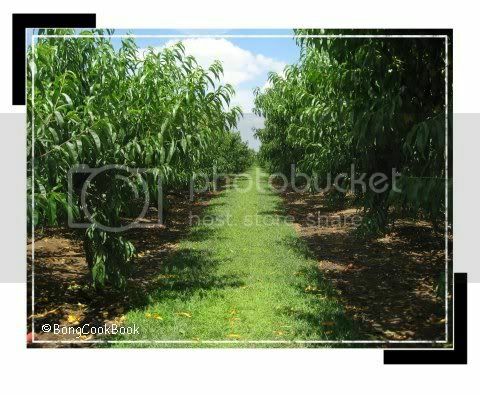 The rows and rows of peach trees were laden with fruits, there was fruit hanging from all possible branches and the kids had a fun time plucking them and plonking them in the basket. They ran through the trees, hung on the delicate branches (you are not really allowed to do that) and had a general good time. I would suggest a trip to these orchards a very good way to entertain your kids during summer. Its relaxing, exhilarating and reminds you of the days when you would climb up the guava tree and get a bunch of green guavas in the nook of your long A line frock. Once back with all the peaches I was not sure what to do with them other than distributing a large share. I am not really a very fruity person and though I love trees, even those with fruits hanging from them, I am not really too keen on eating them. The one fruit I really, really love is watermelon and I love it as it is without messing up. Even as a juice I like the chunky watermelon juice which needs a spoon to scoop up the chunks. Also I add almost nothing (maybe a little sugar) to my watermelon and that’s it. So I didn’t really have anything to submit for dear Bee & Jai’s AFAM. And then there came the peaches. 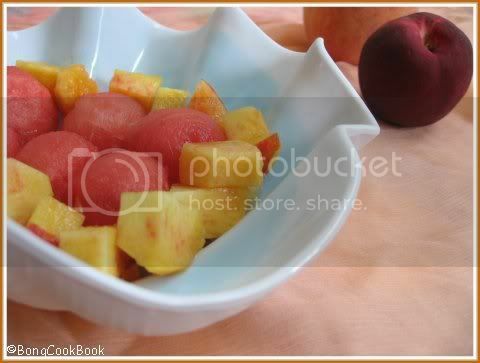 I googled for a peach salad and found this. I had nothing that was in the ingredient list except the peaches. So I paired up the peeled and cut peaches with my dear old watermelon, drizzled 3 tsp of lime juice mixed with 1 tsp of honey for 1 peeled and diced peach + six melon ball and let it chill. It tasted good but then give me my watermelon in its pristine condition any day. This goes to Bee & Jai's AFAM-Watermelon , an event that originated from Maheshwari's (whom we are missing very much) brain and blog. I would suggest you follow the original recipe to make the right salad. A little watermelon joke that I want to chronicle, to laugh at when I get old. Watermelon in Bengali is called Tormuj. Now Tor in Bengali is synonymous to Tu in Hindi or You in English. Last year when S took a real liking to watermelon we told her it is called TorMuj. She analysed it as Tor + Muj i.e. Your + Muj. So when she eats a watermelon she says “Ami AmarMuj khachi” i.e. “I am eating My Muj”. When I eat it she says “Tumi TomarMuj khachcho”. The name of the fruit is Muj for her while she adds a pronoun. If you didn't get the joke just let go. 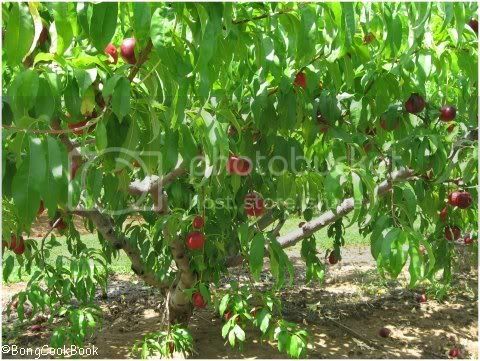 Trivia: Peach is the state flower of Delaware and the state fruit of South Carolina. 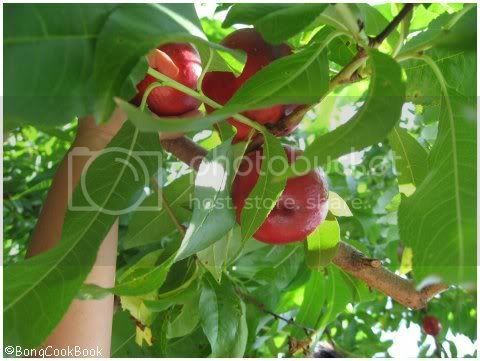 The Stae of Georgia calls itself the "Peach State"
Long back Indosungod had asked “Whats a typical Bengali Breakfast ?”. As I munched on my Seven Whole Grain Kashi Bar reflecting on what good the fiber and the flax seeds were doing to me, I tried to give her question a thought. I thought of the times at home when my Ma would cook up amazing breakfasts not only on weekends but also on busy weekday mornings. When I thought such breakfasts were the norm rather than a luxury and turned up my nose at everything that I didn’t like, yes I even had a choice!!! My Ma was pretty cosmopolitan when it came to breakfast. So even though it would be Macher Jhol and Bhaat (aka Fish Curry and Rice) for lunch, we would have everything from Alu Paratha (North Indian), Uttapam(South Indian), French Toast(Continental), Noodles(Oriental),Chirer Pulao(Bengali version of Poha), Parota-Tarkari(Bengali), Kochuri(Bengali) to Luchi ar Alur Dom (Bengali) for breakfast. 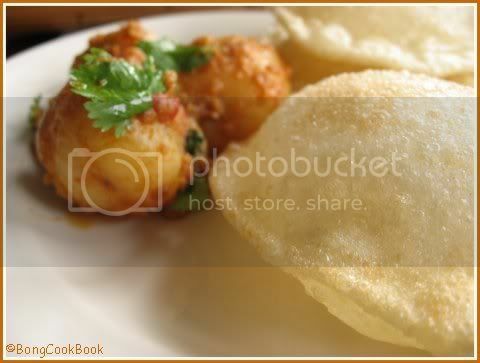 Of this Luchi Alur Dom was quintessential Bengali and the one I liked the least for some obscure reason. Things have changed, I crave for some perfectly puffed up pristine white luchis now and spicy alur dom to go with it. Luchi (ch pronounced as in chair) is a deep-fried flatbread made of bleached wheat flour or maida that is typical of Bengali and Oriya cuisines. It is almost like Puri, but while Puri is usually brown, Luchi is always white. 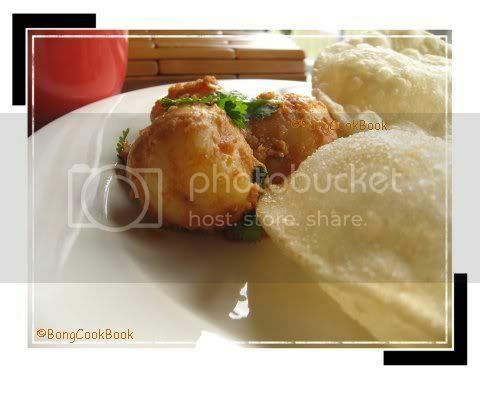 Hot puffed up luchis are served with a myriad of dishes according to ones liking and also the time of the day. Luchi with Begun Bhaja(fried eggplant slices), Luchi with Aloo Bhaja(thin strips of potato fried), Luchi with Cholar Dal, Luchi with Payesh, and of course Luchi with Alur Dom are all time favorites. Luchi with Kosha Mangsho(a spicy mutton curry)and at times even Luchi with Aloor Dom is a dinner favorite and served as a dinner menu on special occasions. So if you have something to celebrate be it a person or an event, a Bengali family will serve you hot luchi with mangsho or aloor dom for dinner accompanied by several other things. They would serve you perfectly puffed up luchis one after the other straight from the fire, while you sit devouring them, losing track of the numbers. The patriarch sitting by your side would show you how to tap the proud puffed up luchi and thus release its latent heat and then wrap it around a piece of mutton or potato and put it to in your mouth in one go. The teenager on your other side might roll up his luchi with sugar preferring it to the mangsho while his Mom might be dipping hers in some sweet brown liquid nolen gur. Do not get distracted, and do not count your phulko luchis, they are more than a blessing, so just enjoy them. Now me and flour are not the best of friends, but I do give in to luchi cravings now and then and take out my chaki-belun (rolling pin and the flat surface you roll the dough on). My now 3 and ½ year old is pretty fond of luchis and I think for her sake I should brush up my act and roll out this pretty white beauties more often. Get this much loved recipe in my Book coming out soon. Check this blog for further updates. To relive a typical Bengali Jolkhabar, I made Luchi and Aloor Dom (Luchi with a Spicy Potato preparation, the D in Dom pronounced as Th in That) for breakfast over the weekend.For us it went on to be a big brunch though, something that made everyone happy. Edited on August 22nd, 2016: Inspired by Sawan Dutta's Maachher Jhol videos, the girls were inspired to sing a Luchi song. They also roped in Didun(my Ma) and interviewed her on the luchi making process. It was a fun morning, very amateur, but fun. Years later when they look back on this, they will either cherish it or die of embarrassment. Already they have warned me , not to divulge, who in the family sang the song as it could jeopardize their future singing career !!! Please do listen and hope it will inspire you to roll and fry more luchis. The recipe is added at the end of the video. 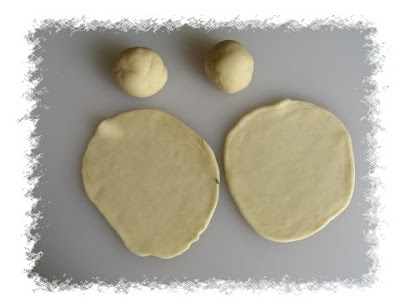 For more details on what exactly is luchi and the recipe in details please follow this recipe. Water ~ to make the dough. I use warm water. 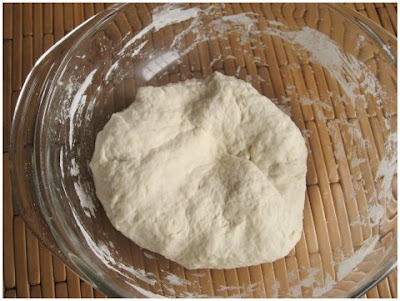 In a bowl where it is easy to knead the dough I added 3 cups of All Purpose Flour. Sprinkled a little salt and then added water gradually, while I mixed the flour with my hand. The luchi is deep fried, so heat enough oil in a Kadhai. Wait for the oil to be piping hot. It should not be smoking though. Dip a corner of a rolled out luchi in the hot oil to see how the oil reacts, if you see the bubbles you know the time is right. This test is important as the heat of the oil is an important factor for luchi to puff up. Release the luchi gently in the oil and press the sides with a flat spatula. The right heat of the oil and the pressing makes the luchi puff up just so. As soon as it puffs up, flip it on the other side and then take it out with a slotted spatula/chalni which has holes in it. Potatoes/Aloo ~ 12-14 small round ones. I used the tiny baby red ones. For larger potatoes you need to increase the spices. Once the potatoes are done, put them under cold running water and peel them. The jacket is out in a jiffy. Add the Onion paste and fry with a tsp of sugar till the onion turns a pinkish brown. Add the tomato and sauté till the tomato is nicely mushed up and well integrated with the onion. Add the Ginger Paste. Mix the Cumin Powder, Garam masala Powder, Red Chilli Powder with 2 tsp of yogurt and add to the Frying Pan. At this moment remove the Pan from heat for a couple of minutes. Sauté the masala till you see the oil separate from the masala. Add the potatoes and mix well with masala. Sauté till the potatoes take a light golden colour. Add very little water and salt and cook till the water almost dries up to give way to a moist but dry gravy. There won’t really be any gravy as such and the masala will nicely coat the potatoes. Some other variations of Aloo Dom can be found here. 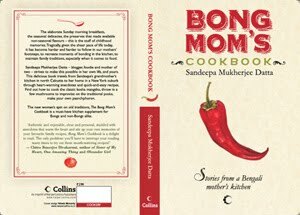 If you are a Bong or tuned to Bengali food, can you please tell me what is your idea of a Bengali Breakfast ? 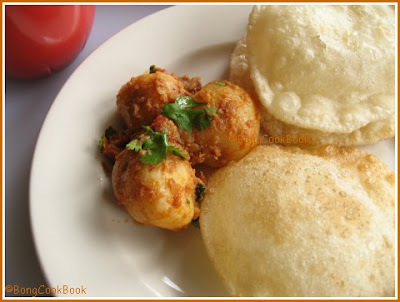 Trivia:Though I have highlighted Luchi as a breakfast menu here, ideally for a Bengali Luchi is something that can be served for breakfast, lunch or dinner. It holds a highly esteemed position in a wedding feast and also is offered to the Gods as a Bhog during Pujas.